AU 143 earned his way to herdboar status after siring the popular Guyer barrow last fall that was Reserve Champion Middleweight Cross at NAILE. 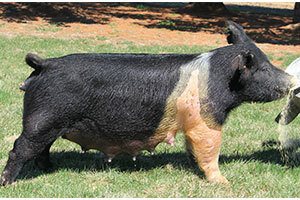 AU 143 comes from arguably the best litter of Ante Up’s ever born here. ‘Isaac’ is a littermate and he has made a tremendous impact for Kirk and his program at 4K Farms. 143-11 was a successful show gilt for the Lackey family during the Texas summer show season and ended her career as the 5th Overall Commerical Gilt at 2015 Arizona National. She is now working in our herd. 143-12 was a successful show gilt for the Norris family in the North Texas show circuit and currently claims the title as the mother of a pair of super impressive boars on feed. Part of what always made the 143’s intriguing was the 119-5 sow behind them. For her time, she was the heaviest structured female we had produced and was one of the reasons why we fell in love with Mountain Man. Its worth noting that this sow is a littermate to Miss Abby, the sow at Sites Livestock that has proven to be one of the very best generators in the business. 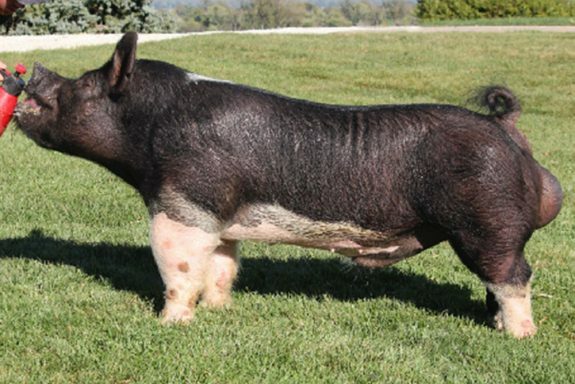 To go a few steps further, the sow family behind 119-5 is our most trusted with the extended pedigree including the 75-7 Swagger sow – mate to the red belt barrow shown by Wolf’s a few years back, 76-3 Priority One – the sow we cloned after her early success and untimely death, and finally 53-11 Black Attack – the anchor of all things good at HH. This boar is different to look at but the pigs he’s siring speak for themselves.